I baked a simple layer cake, iced with butter cream and decorated with goldfish crackers, gummy sea life creatures, teddy graham crackers. Beach towels are made from Fruit Stripe gum and floats for bears are gummy life savers. The “sand” is made from crushed vanilla wafers. I cut a hole in the top layer of cake and filled with blue jello (I made the jello with less water, so that it would set up faster) for the water. The “trees” are made from pretzel rods. I made the palm leaves and seaweed by melting white chocolate and tinting it with green food coloring, placed into a zipper bag and cut off end, then piped onto waxed paper and let harden. I attached the leaves to the pretzels with icing (coconuts are cocoa puff cereal). 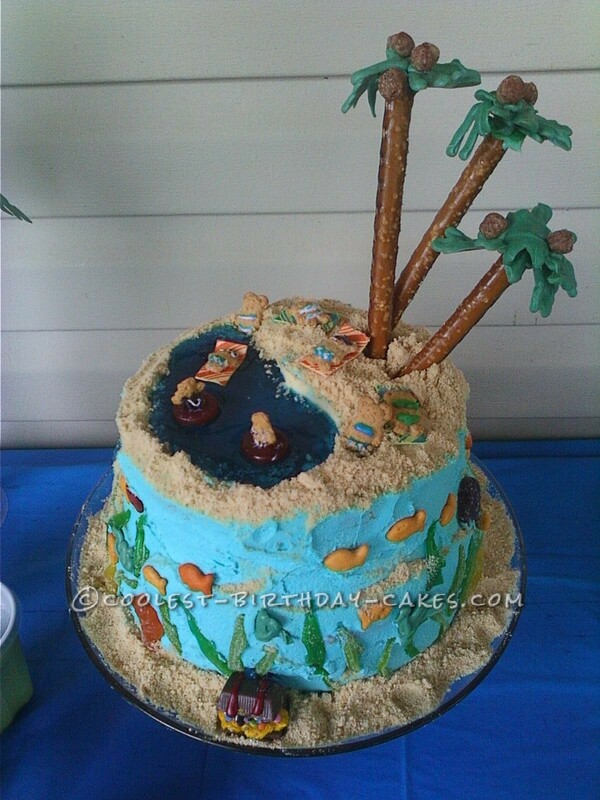 This cake was not hard to make, but was time consuming. The kids all LOVED it, especially my daughter. It was for her 9th birthday. Birthday cake idea Posted by Kelly B.